Yesterday, Switzerland published their 2017 statistics (permalink). This adds to recent publications from Slovakia and Luxembourg, which we provide analyses for below. You can find more information on our Worldwide Animal Statistics page, as well as our Historical Statistics page, which now contains over 150 entries as we continue to build the largest database of animal research statistics worldwide. 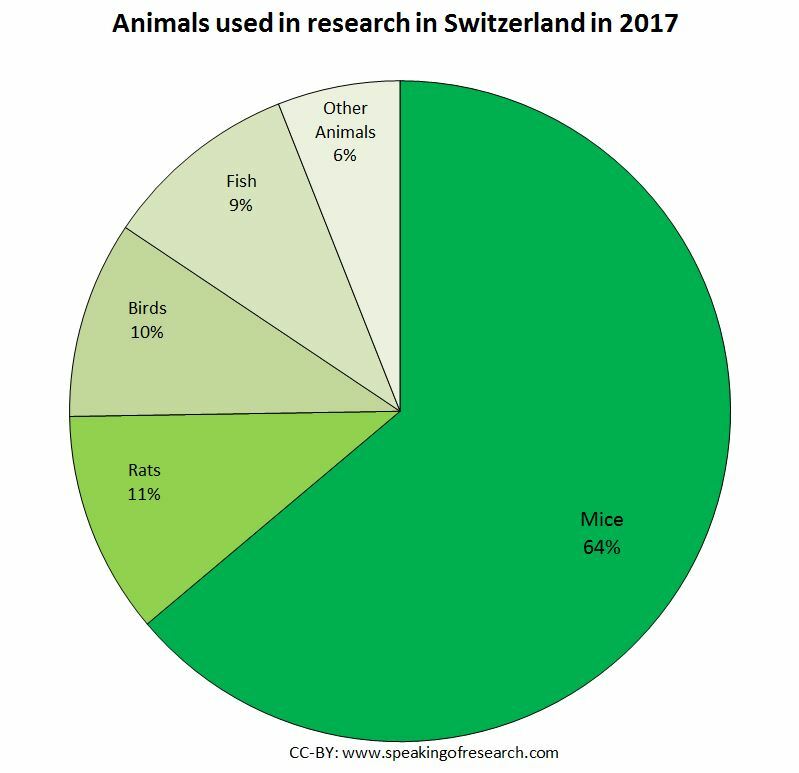 The statistics for animal research conducted in Switzerland in 2017 (permalink) were released yesterday. We have translated these tables into English and the data is summarized below. 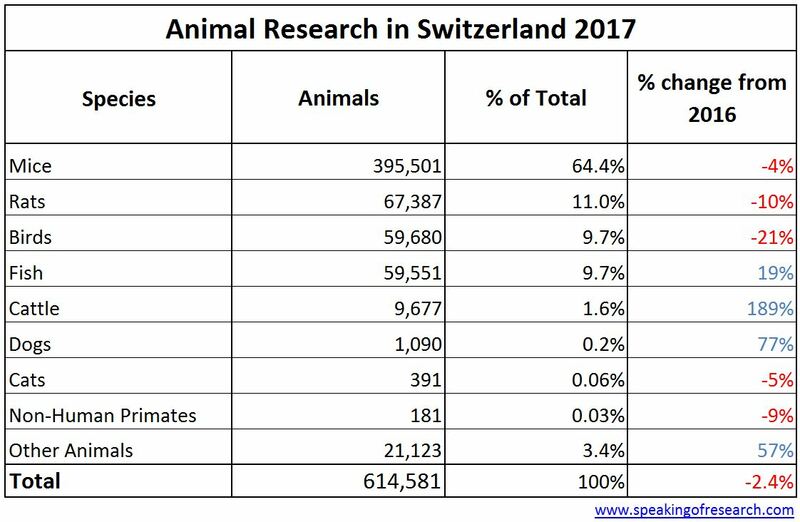 Overall the number of animals used in research in Switzerland was 614,581 in 2017, down 2.4% from the previous year. According to the the Federal Veterinary Office, the BLV: “This decline confirms the trend observed over the last ten years, even though some fluctuations may occur in individual years. These are mainly due to the fact that in 2010 and 2015, for example, there was a greater need for animals for individual, time-limited experiments.” Most of these animals were involved in basic research (61.5%), with “discovery, development and quality control” being the next most common (19.1%). The remainder were used for other reasons including disease diagnosis, education and training and protecting the environment. Mice were again the most prevalently used species (64.35%). 94.72% of the animals used in research and testing were conducted on mice, rats, fish and birds, similar to other European countries. Monkeys (181), cats (391) and dogs (1,090) together accounted for 0.27% of all research animals, with an overall increase of 437 animals from 2016 for these species. The 77% rise in dogs comes a year after a huge fall between 2015 and 2016. Between 2011 and 2015 the average number of dogs used was 3,500, in 2016 this fell to 616, before rising by 1,090 in 2017. 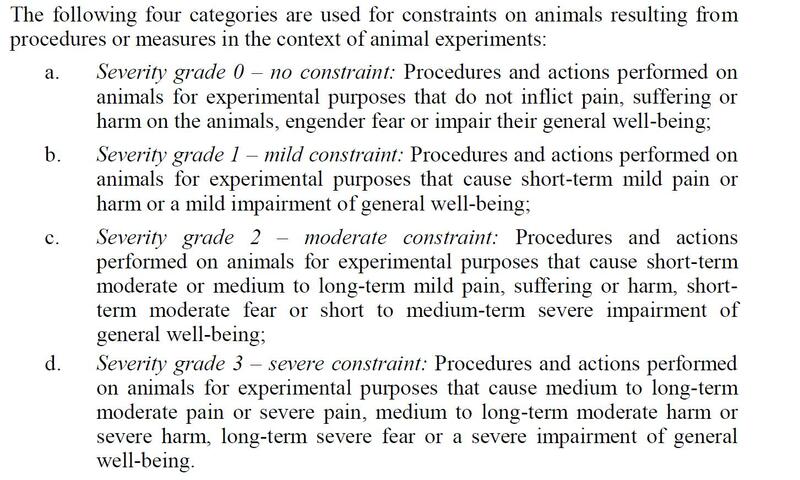 Pain, suffering and harm, were also measured and classified under four grades of severity; 0, 1, 2 and 3 (see translated definitions of severity). In 2017, 42.1% of experiments were Grade 0, 30.5% were Grade 1, 24.6% were Grade 2 and 2.8% were Grade 3. These numbers are relatively consistent across time, with on average 78% of all animals being exposed to no or minor short-lasting pain and distress. 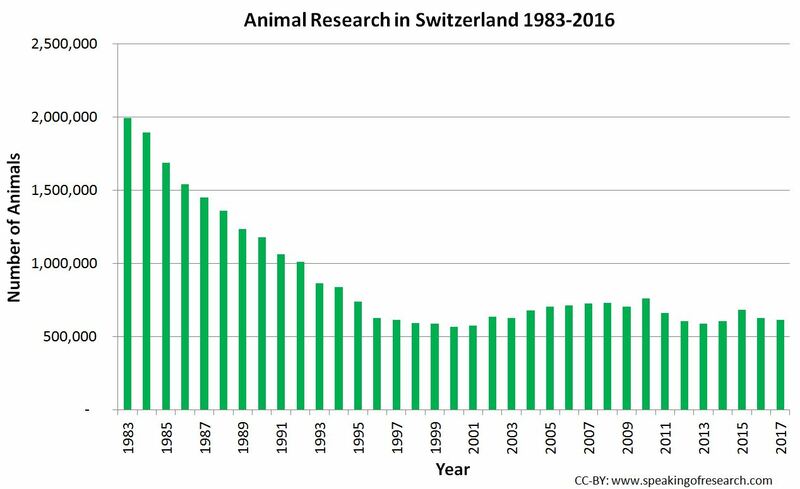 Trends in Switzerland animal experiments 1983-2017. Click to Enlarge. 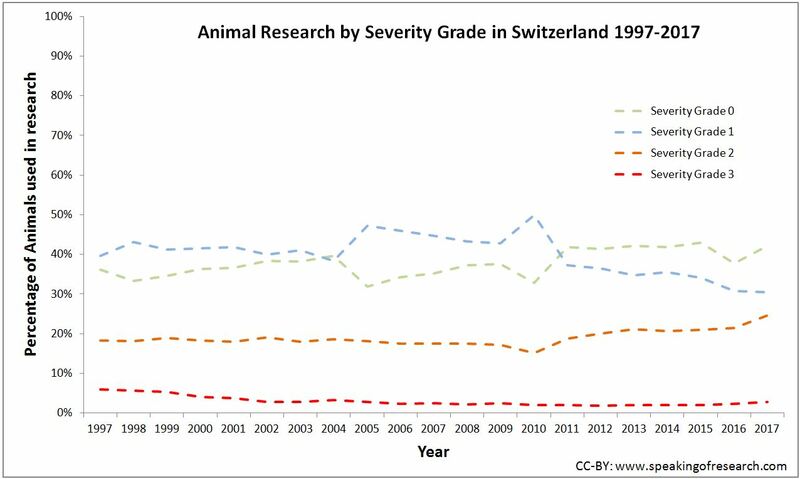 Overall there was a steady downward trend in the number of animals used in research in Switzerland from 1983 to 1995. Since 1995 the number of animal experiments has remained fairly consistent at around 650,000 animals. Slovakia was beaten by the Czech Republic to become the first EU country to report (permalink) its annual statistics in May. 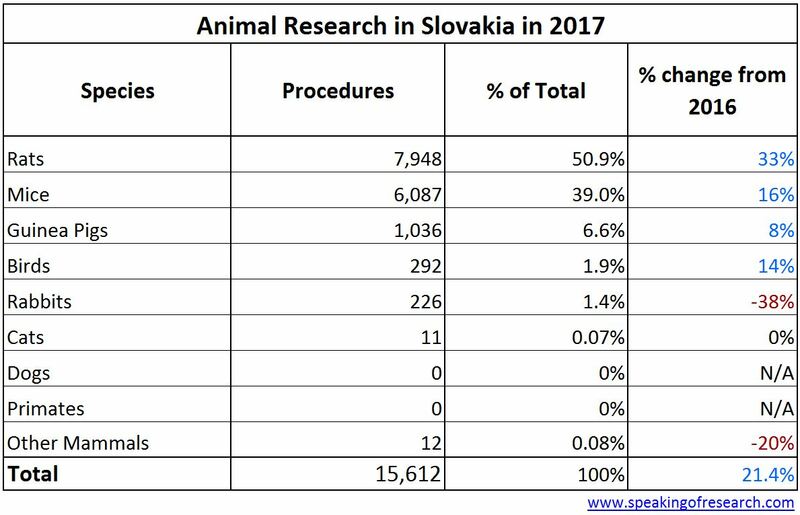 According to the State Veterinary and Food Administration (ŠVPS) there were 15,612 procedures on animals in Slovakia in 2017, a 21% rise from 2016. 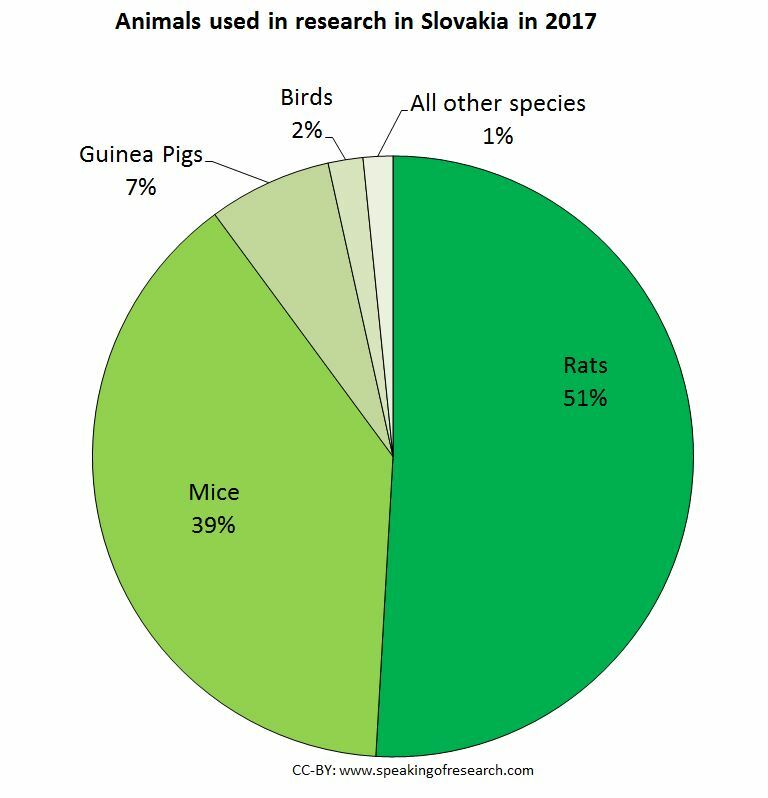 Rodents accounted for over 95% of research procedures in Slovakia. Slovakia is curious in that it is one of the few countries where more rats than mice are used. Use of rodents was the main source of the rise, with a 33% increase in rats, while the largest decline was in rabbits (down 38%). Dogs have not been used in Slovakia since 2015, while the number of cats remained constant at 11. Retrospective analysis of severity showed that 40% were mild or non-recovery (down from 52% in 2016), with 58% moderate (up from 46% in 2015) and 2.3% were severe (up from 1.2% in 2015). 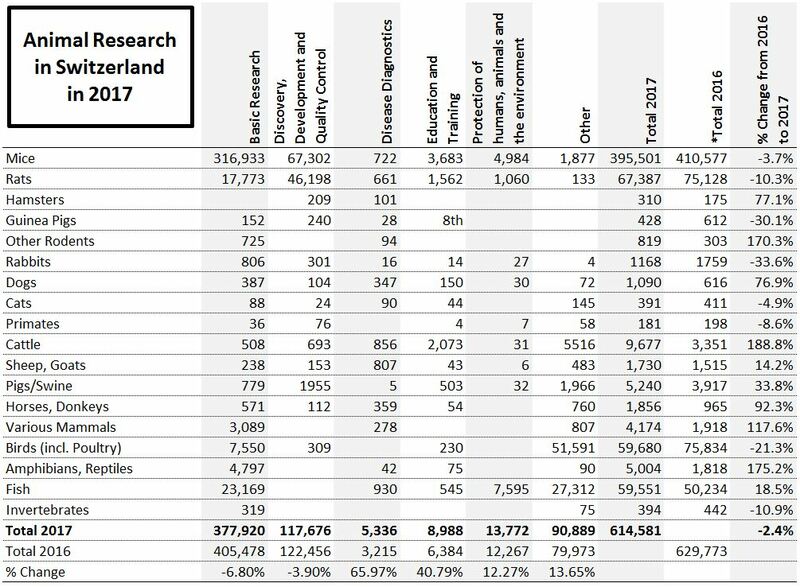 The most common use of research animals was Basic Research (69.3%), followed by Regulatory use and Routine Production (18.1%), Translational/Applied research (6.7%), and Maintenance of breeding colonies (5.5%). Within the basic research, common areas of study were the Nervous system (38%), Reproductive system (11%) and Cardiovasular system (9%). All of the animals used were bred within the EU. 38 procedures were on animals previously used in research, meaning there were 15,574 animals used for the first time in 2017. 10% were genetically modified and 90% were not (up from 7%/93% in 2016). With only four years of data, it is too early to draw any long-term trends in animal procedure numbers. 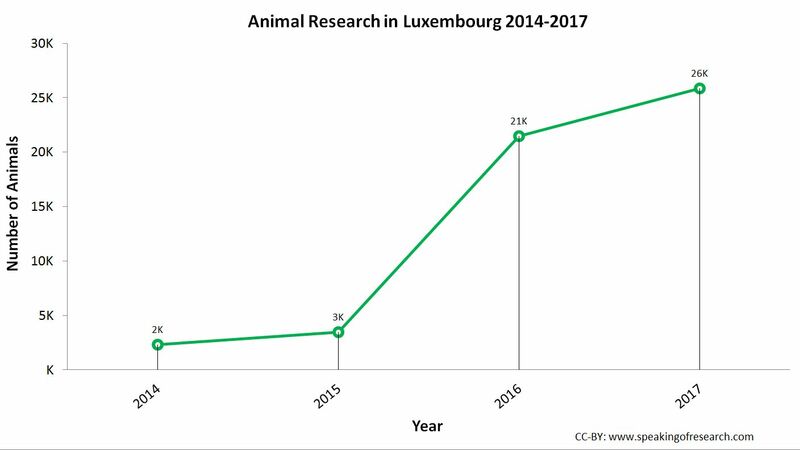 Luxembourg’s annual report on animal research (permalink) showed there were 25,841 animals used in research in 2017, up 20% from 2016. Only three species of animals were used: fish (78%), mice (22%) and rats (0.4%). Both mice and fish procedures rose by over 2,000 in 2017. 95% of procedures were for basic research, of which 82% (mostly fish, as well as all 96 rats) were for studies into the nervous system. Mice were mainly used in studies of the immune system and cancer research. 86% of the animals were not genetically altered, compared with 14% which were. Animal research has been on the rise in Luxembourg, with a huge jump between 2015 and 2016. It is too early to tell whether this rise will continue in future years. 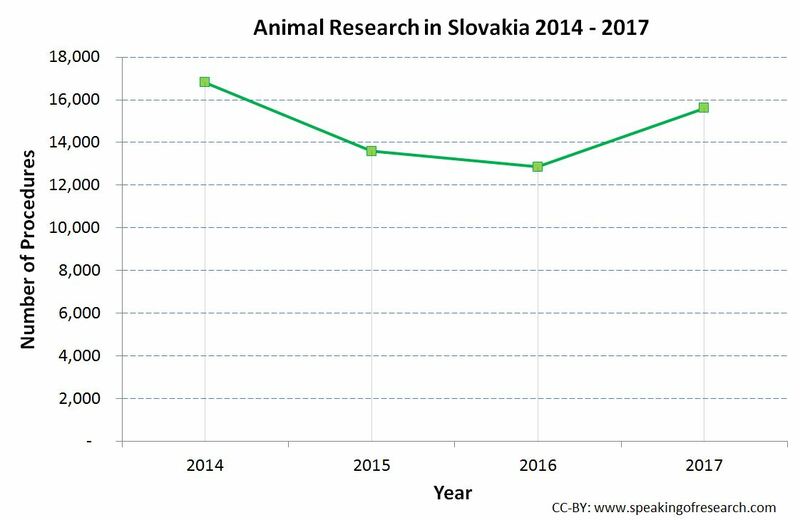 Austria reported (permalink) 264,071 procedures on animals in 2017, a 4% rise on the previous year. The rise in animal experiments has come about due to a large rise in fish numbers (doubling from 10,436 to 20,927) and an 11% rise in mice. The number of rabbits fell for the second year in a row (having doubled between 2014 and 2015), causing them to become the third most used species after mice and fish. Almost 90% of research was conducted on mice (81%) and fish (8%), with rabbits and rats being the next most common. No primates were used in Austria in 2017 (or the previous three years) and dogs and cats accounted for approximately 0.1% of all animals used despite the rises in the number of procedures for both species. The retrospective assessment of animal suffering showed that 68% of procedures were mild or non-recovery (where the animal is never woken from anaesthesia). 24% were classed as Moderate, and 8.1% were Severe. The only non-rodent mammal to be involved in Severe studies was 28 pigs. All studies on dogs and cats were classified as mild. After falling between 1990 and 1999, the number of animal procedures has been slowly rising since then. 2017 represents the highest number of procedures since 1993. This probably reflects rises in R&D expenditure within Austria. Posted on June 29, 2018 June 29, 2018 by EditorPosted in News, StatisticsTagged Luxembourg, Slovakia, Statistics, switzerland. Next Next post: Research Roundup: Future proofing our response to pandemics; new approach to administer insulin and more!